Your wedding is one of the most important days of your life. It is also one of the most stressful days to plan for. 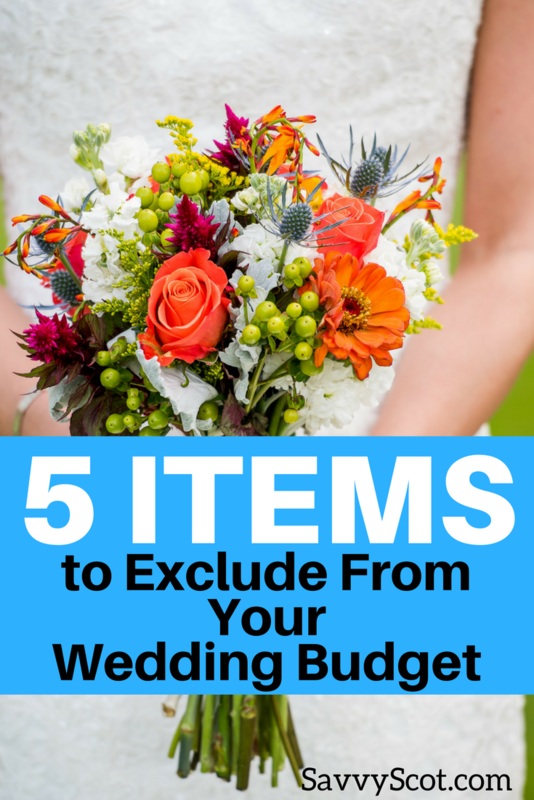 Help reduce some of that stress and your budget by excluding these items from your wedding budget. Save The Date cards were once a way to announce your wedding date and generate excitement for the big day. Unless you are having a destination wedding or scheduling your wedding around a major holiday, you can exclude these from your wedding budget. With the invention of social media, Save The Date cards are nearly obsolete. Once a couple announces engagement on social media, it is only a matter of time before the date is spread via word of mouth. Keep it mind, it may be appropriate to send these to out of town guests. Rehearsal dinners are usually intimate gatherings allowing the two families to get to know each other a little before the big day. Say “No!” to the extra costs associated with having a rehearsal dinner by having a casual get-together at a friend’s house. Keep it simple by offering light refreshments or dessert only options. Sure, it makes for a pretty entrance and send-off, but that’s it. Is spending all that money on an entrance really important? If using your own vehicle is out of the question, look into borrowing a friend’s car or renting one for the day. Okay, okay. I know you are thinking I am crazy now, but hear me out. How many times will you wear your wedding dress? Most brides only wear them the day of their wedding. Some brides wear them an additional date for wedding pictures that may not have been taken during the wedding. Save yourself a few hundred (or thousand!) dollars by renting your wedding dress. Not only will your budget thank you, but you won’t have to worry about what to do with your wedding dress after the big day. Used for an hour and thrown away afterwards? No thanks. Wedding programs aren’t necessary. The only person who will keep these special mementos will be the bride/groom and perhaps their parents. This one isn’t a major expense, but brides on a budget have to cut costs somewhere. Put these at the top of that list. Unless you are doing scented petals to be thrown during a send-off, these are unnecessary. Think about the last three weddings you have been to. Can you recall what each cake cutter or topper looked like? Chances are the answer is no. What’s the point of a fancy cake cutter or topper when the cake itself is the main attraction? Skip out on purchasing the fancy cake cutter and use one you already have available. Following along with the last idea, having a grooms cake has only been tradition in the last two decades. Combine both cakes into one and reduce the overall size. After all, how much cake can one wedding party consume? Open bars are a budget breaker. Help keep your budget intact by doing away with alcohol. If you are set on providing alcohol, serve only one or two signature drinks. If thinking about how many wedding favors will get left behind is stressing you out, then skip the wedding favors and allow guests to bring home what really matters: the memory of two people joining as one. If you are keen on keeping favors in the budget, aim for something small that could be used (or eaten) immediately or combined with part of the reception or wedding decor. Think: combining center pieces with favors, party bags for guests to bring home cookies and candy, or sparklers for a night-time send off. Every budget is different and every bride will ultimately choose what is a must-have for their special day. If you are a bride on a budget, excluding some of these items from your wedding budget just may make your planning more enjoyable. Check out some of our other tips for saving on your wedding budget and tell us which item you wish you had excluded from your wedding budget. This post is worth reading for all the would-be couples. When you are already spending so much on your big day then it’s advisable to cut all the unnecessary things. Why to dig a hole in your pockets by adding less important things to your wedding. There many other things you can do with this saved money. So just don’t get carried away!